When I’m hunting I’ve always been a guy that likes to be on the ground. I don’t have a fear of heights or anything like that but I like to be able to move if I need to. Although I don’t own a tree stand, I’ve sat on a few big branches before. One time, I had a hunter (didn’t know the guy) sit beside the tree I was in. He had no idea I was there until I unlocked the bolt on my rifle to get his attention. After an embarrassed glance, he wandered off somewhere else. That got me thinking. The obvious advantage to being in a tree is that deer seldom look up because their predators are typically on the ground. The other advantage is that your scent is up and away from the deer. Some guys recommend 30 feet as a good height for tree stands. And there is always the view. You can see a lot farther from a tree and will have more warning when deer approach. I see a lot of bowhunting videos of guys in trees and they seem to be able to hit the kill zone. The trajectory of the arrow, or bullet, at a downward angle is generally more lethal than on a flat area. You do have to practice shooting from a stand though as there is a slight adjustment, especially with a bow, for the angle. A good rule of thumb is to aim low or aim where you picture the arrow to come out of the animal. Often, deer “jump the string” and crouch when they hear the shot. This is another reason to aim low. 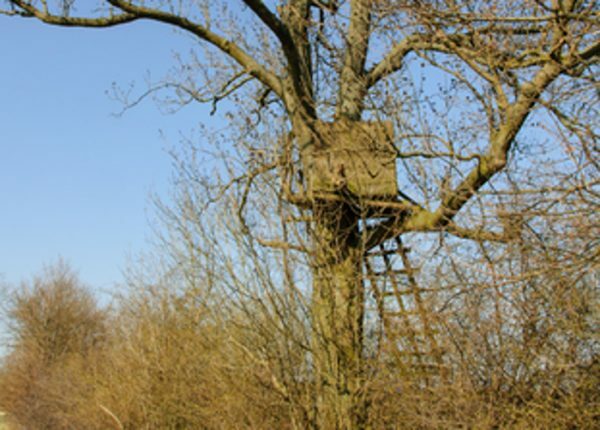 There are many different types of tree stands. It’s worth it to get one that is light and comfortable and don’t forget to use a harness. There have been many bad accidents with tree stands. My preference, however, will continue to be ground blinds because it just feels more natural, more primal and I am free to wander. To me there’s nothing like being part of the action. It just seems like when you’re in a tree, you’re kind of watching the show. At ground level, especially during a stalk, you truly feel like you’re hunting. Having said that, there are some do’s and don’ts about hunting from the ground. Don’t waste your time on buying one of those pop-up blinds. Make a blind out of what nature provides. For one, it will mimic the natural surroundings, and you won’t need to shoot from your knees or through a window etc. Do make more than one blind so that if one doesn’t produce, you can quietly, slowly, slip into the other one. Do build these blinds before opening day—that way, deer will get used to them. Try not to make something that stands out like a sore thumb or skylines you. Use common sense and utilize ditches, bushy areas around water, deadfall trees and whatever else will make you seem natural to the landscape. I absolutely love getting out there a few weeks before the hunt while scouting, and create a scenario for opening day. The last, and probably most important thing you can do, is to make sure that you account for the wind. Figure out where it is most likely going to blow towards you and that’s where you want to set up your blind. Like I said, if you show up and get a weird wind shift, you have the option to go to your other blind(s). Be creative and remember what makes the hunt special. For me it’s the thrill of the hunt and I want to participate as fully as I can. If I’m stuck in a tree, I’ll probably start thinking about breakfast, and might even fall asleep.